If you love old boats, history and a bit of nostalgia, then the three-day Admiral’s Cup 50th anniversary regatta in Sydney starting Friday on Sydney Harbour will no doubt appeal. It’s been 50 years since Australia won the Admiral’s Cup in Cowes for the first time. 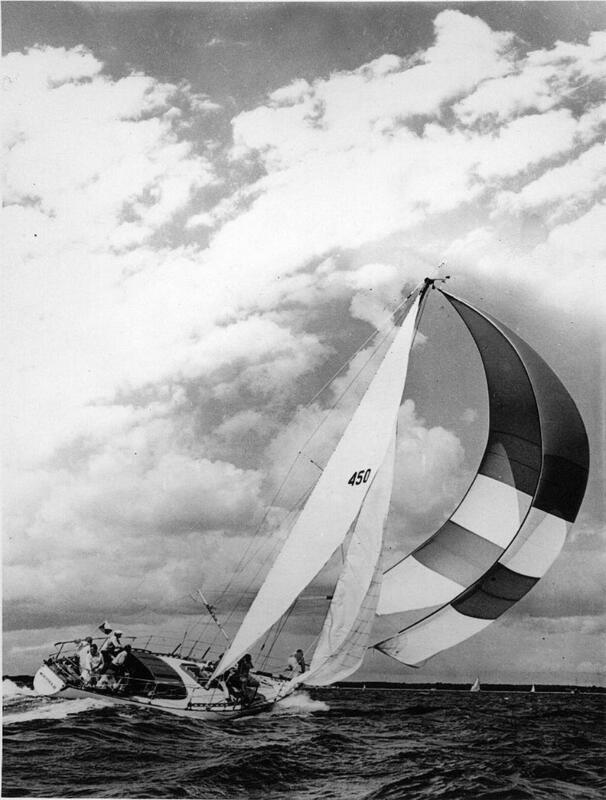 It was 1967, following our inaugural participation in the event two years earlier, when Australia finished second in the Cup which was first held in 1957 off Cowes in England. In 1965 the Australian team comprised Caprice of Huon (Gordon Ingate), Freya (Trygve and Magnus Halvorsen) and Camille of Seaforth (Ron Swanson). The team placed second from eight nations, spurred us on to greater things in this prestigious competition held every odd year. Two years later, in 1967, our team comprising Mercedes III (Ted Kaufman), Balandra (Robert Crighton-Brown) and Caprice of Huon (Gordon Reynolds) won the AC, prevailing over eight other nations and beating the second placed British team by 13 points. Hence the 50 year reunion. All three owners are gone now, but the trio led long and rewarding lives. Kaufman, who in collaboration with Bob Miller (later famously known as Ben Lexcen) designed Mercedes III, died early in 2014 at the ripe old age of 94. Crighton-Brown, knighted in 1972, passed away in London in 2013 aged 93. Reynolds the 1967 team manager, a CYCA Life Member and founding member of Middle Harbour Yacht Club, passed away in 2005 aged 84. There is a lot to be said for sea air. All three will be represented by their sons at the 50th reunion. Scott Kaufman has flown from New York to represent his late father Ted, co-designer and skipper of Mercedes III, Anthony Crighton Brown has arrived from London to sail on Pacha, in lieu of 1967 entry, Balandra, which is currently undergoing restoration, while Sydney brothers Tony and Rob Reynolds will take their late father Gordon’s place on Caprice of Huon, with the boat’s 1965 Gordon, Ingate, skippering. And because the Admiral’s Cup was a big prize in yachting, we kept going back for more – sailing against the best teams of three from around the world. The peak years were 1975, 1977 and 1979 when 19 nations competed. Sagacious V’s original owner, Gary Appleby, chartered his successful yacht to the American team in 1987, but will be at the helm of the boat, with seven of his original crew from that era including Bob ‘Bashem’ Fraser, Phil Morgan, Brad ‘Keith’ Stephens, Toby ‘Puppy Dog’ Richardson, Henry ‘Hank’ Paterson and Greg ‘Vengeance’ Johnson. Simon Kurts is skippering Love & War with four of his late father, Peter’s original crew, including Peter Shipway, John ‘Hanger’ Harris, Mike ‘Hessie’ Hesse and John ‘Munno’ Munsen. John Wiggan and Doug Patterson (brother of Henry) will be aboard Caprice of Huon on different days, which will be steered by original owner, Gordon Ingate, who at 91 is still winning major Dragon titles. Sir James Hardy will be at the helm of Mr Christian, while Norman Rydge will steer Lorita Maria, replacing his late father, Sir Norman Rydge. We won the Cup again in 1979, the toughest on record in which 16 sailors tragically lost their lives and over 100 rescued in the Fastnet Race, won by Ragamuffin. Our team was Impetuous (Graham Lambert and John Crisp), Ragamuffin (Syd Fischer) and Police Car (Peter Cantwell). Lambert and Crisp will assume control of their next boat, Too Impetuous, while Fischer and Cantwell will watch from support boats. Race 1, on Sydney Harbour, scheduled to start at 1pm, then on Saturday the boats will sail a short offshore racing, starting from 10.30am. On Sunday, one final Harbour race, due to start at 12pm. A full social program has also been organised. Below is a list of entries – some boats are replacing others that are no longer or not available for this celebration event, though their vintage fits. Obviously the same people no longer own the boats, so thanks to those who have come to the party and provided for this special occasion. The three-day Australian Admiral’s Cup 50th reunion regatta, with 21 yachts of yesteryear entered, along with the names and faces that came out of the woodwork, was a spectacular success, most sailing and others out to watch - all hoping for a repeat event in the not too distant future. Races 1 and 3 were held on Sydney Harbour in near-perfect conditions, while Race 2 was a short offshore race starting on Sydney Harbour, up to Long Reef and return. Day 2 was hosted by the Cruising Yacht Club of Australia, which held the famous Admiral’s Cup trophy in a display cabinet, along with memorabilia. The crews packed into the lower bar to catch up and tell stories over a few drinks. Commodore, John Markos, recreating an old custom, awarded winner Sagacious V with a bottle of Champagne Mumm. The French champagne maker was a sponsor of the Cup for many years and used to award the daily winner his weight in Champagne Mumm. In those years, a few savvy owners weighed themselves down with winch handles and the like; such was their taste for the French bubbles. Sydney Amateur Sailing Club hosted the final day, including the prize giving, before all took their aching bodies home – many had flown in from overseas and interstate – a big undertaking. A freshening nor’ easter opened the event, white caps and all. It kept all on their toes and the start was as competitive as ever, resulting in a couple of collisions, the worst between Impetuous and the Gordon Ingate skippered Caprice of Huon (owned by a philosophical David Champtaloup who finished the regatta on Love & War). It ended with a badly broken leg for Charlie Herbert, who had recently recovered from a hip operation. It also meant the retirement of both boats, Caprice coming off worst. A lot of hurt bodies came ashore that afternoon. The usual ‘stay and play’ of the sixties, seventies and eighties, was a little shorter than usual. “Yeah, a few aches and pains,” Sagacious V’s Toby Richardson was one of many who admitted that afterwards. In a close finish, the race was won by Ragamuffin from Love & War (owned and steered by Simon Kurts, but sailed at the Admirals’ Cup by his father Peter) after the latter’s main tore in the last third of the race. Her crew put a reef in, but could not keep pace with the longer Ragamuffin, which Syd Fischer sailed to victory in the tragic Fastnet Race in 1979, cementing Australia’s second Admiral’s Cup win. Joining Ragamuffin in that 1979 A.C. team were Impetuous, then owned by John Crisp and Graham Lambert, who sailed this regatta on the two’s next version, Impetuous II) and Peter Cantwell’s Police Car. On board Ragamuffin were original crew members Tony ‘Ace’ Ellis (1969, ‘71, ’73), Peter Hemery (‘69, 71), Bruce Gould (’73), Ian ‘Bomber’ Treharne (’73), Peter Tierney (’71), John ‘Steamer’ Stanley (’73), joined by Henry ‘Hank’ Paterson, a regular aboard the boat for other races. 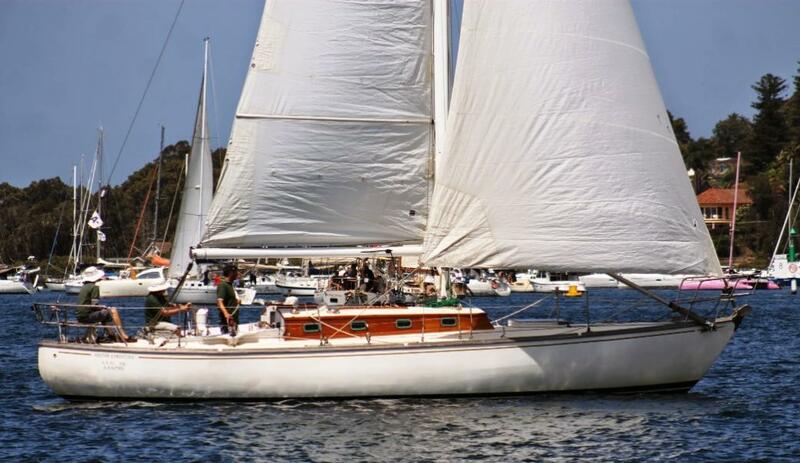 This particular Ragamuffin was designed by Sparkman & Stephens (the last boat German Frers designed for the company before going out on his own) built by Cec Quilkey (as was Love & War and others) at Taren Point and launched in 1968. She represented Australia at the A.C. in ’69 (was top Aus boat), ‘71 - top boat and won the Fastnet Race (the only Aus boat to do so), and in ’73 after she was altered, when the team finished second. 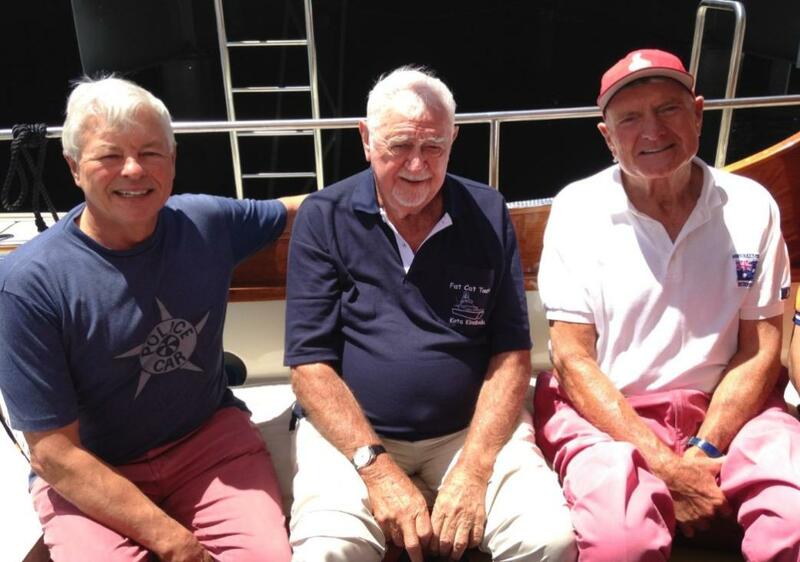 “It was a great regatta - a lot of old faces and great catch up. It was a bit much for some - maybe a different format for next time. I know a lot of work went into it, but it was well worth it,” Tony Ellis said. The short offshore race went to Sagacious V. Gary Appleby was the owner when the team of Sagacious (Swan Premium II), Lou Abrahams’ Ronstan Ultimate Challenge (Swan Premium 1) and Peter Kurts’ Madeline’s Daughter (Swan Premium III) finished third at the Cup. Appleby, who has called Queensland home for years, was aboard for the first race, but out injured for the rest. Sagacious V, with a few of the originals aboard including Bob Fraser (helm), Phil Morgan, Brad Stephens, Toby Richardson and Greg Johnson, beat Wild Oats/Wild Rose (best known under the ownership of the late Roger Hickman) and Peter Stronach’s Mercedes IV – Stronach and this boat represented at the 1975 Cup with Love & War and John Kahlbetzer’s Bumblebee 3. Race 3 and the pressure was off a little at the start, because it was a handicap start, with the first boats away at 12pm in a pleasant breeze. Only one small problem – the big hole across the Harbour near Shark Island while the breeze transitioned and a beautiful nor’ easter arrived after a frustrating 15 minutes of pain. Rod Winton’s Uptown Girl won Race 3 from Greg Maughan’s Syonara and David Salter’s Mister Christian (Peter Kurts’ first boat), with Sir James Hardy seen at the helm over the weekend and looking in better shape than a lot of others. Under spinnaker and well behind them in Race 3, Salacia II and Love & War were in a race of their own, Salacia II adding a blooper to her spinnaker in her attempts to keep Love & War at bay. She beat Kurts’ boat to the line by four seconds after the pair traded positions a couple of times on the run to a thriller finish. Four arrived via the Manly ferry for the first two days, only one remained on the third day, living up to Kurts’ description of the pain factor. “I wish we could do this every year,” was a comment frequently heard from competitors. On the water, but viewing rather than sailing, were owners and former owners, Peter Cantwell (Police Car), Peter Briggs (Hitchhiker – 1981 team) and Syd Fischer (Ragamuffin) – .he represented ’69 (Australia finished second), ’71 (Aus finished third), ’73 (Aus was second), ’77, ’79 (Aus won) ’81, ’93 (lost the Cup to Germany by one quarter of a point) and ’97 (Aus fourth). Fischer captained each of those seven teams. “I still own Hitchhiker and race her at home in Perth, said Briggs, whose wife Robin joined him in Sydney for the reunion regatta. “I’m still married to the same woman (Robin) too – I keep all the best things from my life,” said a laughing Briggs who also owns classic cars. Organised by a group led by Peter Shipway, a competitor at eight Admiral’s Cups and aboard one of his rides, Love & War for this regatta. Thanks too, to those who graciously loaned their boats for Admiral’s Cup races, and those who provided boats allowing A.C. owners, crew and their families to view the races – it was much appreciated. Norman Rydge, Hugh Treharne, Scott Kaufman, Anthony Crichton-Brown, John Wigan, Peter Hemery, Phil Eadie, Wayne ‘Moose’ Johnston, Tony De Young, Ron Packer, Chris McSorley, Tom Stephenson, Michael Hesse, Peter Shipway, John Harris, Mark Walsh, Rob Brown, Gary Geitz and Richard ‘Blue’ Chapman – a small selection from a large gathering. Ron Packer and Peter Cantwell (Police Car) & Peter Briggs (Hitchhiker) - photo by Di Pearson.